JAMMU, Feb 21: Accusing both Central and State governments of their total failure in rehabilitation and ensuring safety of 1800 KP employees posted in Valley Youth All India Kashmiri Samaj (YAIKS) today termed the so called return and rehabilitation move a total mockery. YAIKS during a one day seminar here, today passed a resolution in this regard in which the PM’s return and rehabilitation package was termed merely eyewash. During the seminar YAIKS also released a Vision Document for the welfare of Valley posted migrant employees titled Akhir Kab Tak. The document was released by R K Bhat president YAIKS and it was read by Sanjeev Koul, coordinator VPME. During the seminar YAIKS demanded that entire structure of the employees’ rehabilitation be reviewed after holding a serious and meaningful dialogue with the representatives of the community. 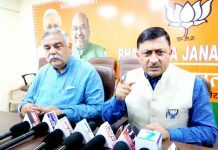 It also demanded that all Valley posted migrant employees including those under PM package and non PM package be treated at par with Kashmiri migrant employees till their concerns are addressed fully. The main demands put forth in the seminar included that fool proof security arrangements be made for these employees by deploying Central security forces at every transit camp so that a sense of security is created among these employees who are under fear psychosis. Besides the transit camp of Hawl in Pulwama district of South Kashmir and Nutunsoo in Kupwara district of North Kashmir needed to be relocated. Through vision document it was also demanded that separate accommodations for the entire Valley posted migrant employees be provided with the provision of basic amenities available within the campus including a modern shopping complex to be allotted to the unemployed members of the community, sanction of risk allowance for migrant employees posted in Valley. It demanded opening of Kendriya Vidyalayas and State run schools manned by migrant teaches in the campus and extending the relief benefits and scholarships to the wards of employees and implementation of remaining jobs under PM package without attaching draconian laws. Besides a sense of belongingness needs to be created among the displaced youth by creating favourable conditions near the transit camps. The YAIKS serves an ultimatum to the Government that if the genuine demands of Vision Document are not settled soon the KPs will be forced restart nation wide agitation. The speakers in the seminar included B K Bhat, vice president YAIKS, Sanjay Ganjoo its secretary, Vinod Bhat, Babita Saproo, Vimal Raina, Arvind Bhat, Rakesh Pandit, Govind, Rakesh Fotedar,Sunil Dhar, Ravinder Koul, Sunil Koul and others. The welcome address was given by Preeti Koul and vote of thanks was presented by Ajay Safaya, secretary, YAIKS and Manoj Handoo, YAIKS general secretary managed the stage.